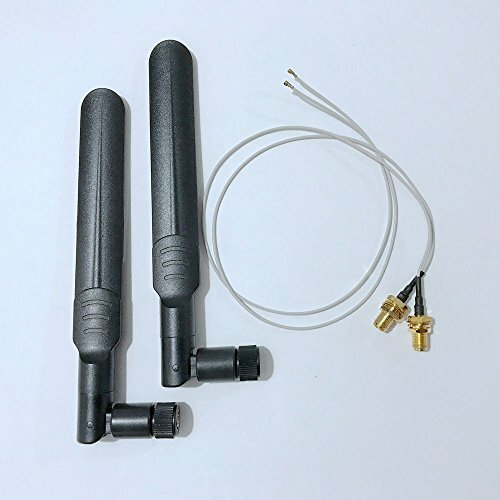 CHAOHANG® 2 x 6dBi RP-SMA Dual Band 2.4GHz 5GHz + 2 x 35cm M.2(NGFF) Cable Antenna Mod Kit No Soldering for NGFF Wireless CARDS. Remarks: Only use for M.2 (NGFF) INTERFACE, DO NOT USE FOR MINI PCI-E INTERFACE. PLEASE CHECK AND CONFIRM YOUR CARDS INTERFACE BEFORE PURCHASE. Only use for NGFF interface, do not use for MINI PCI-E interface. Not Includes the NGFF(M.2) card show on the Picture. If you have any questions about this product by CHAOHANG, contact us by completing and submitting the form below. If you are looking for a specif part number, please include it with your message.